New research has found that eating nuts could lower the risk of cardiovascular disease for those with type 2 diabetes. New US research has found that eating nuts may help to reduce the risk of cardiovascular disease for those with type 2 diabetes. Carried out by researchers at Harvard T.H. Chan School of Public Health and Brigham and Women's Hospital, the new large-scale study looked at 16,217 men and women who completed questionnaires about their diet before and after they were diagnosed with type 2 diabetes. Participants were also asked about their consumption of tree nuts, such as walnuts, almonds, Brazil nuts, cashews, pistachios, pecans, macadamias, hazelnuts and pine nuts, and also peanuts, which are actually legumes as they grow underground. The findings, published in Circulation Research, an American Heart Association journal, showed that eating all types of nuts, and even just a small amount, offered some benefit for heart health, although tree nuts did appear to be more beneficial than peanuts. More specifically, the team found that those who ate five 28-gram servings of nuts per week had a 17 percent lower risk of cardiovascular disease, a 20 percent lower risk of coronary heart disease, a 34 percent lower risk of cardiovascular disease death, and a 31 percent reduced risk of all-cause mortality compared to people who ate less than a single serving per month. However, total nut consumption was not significantly associated with risk of stroke or cancer mortality. 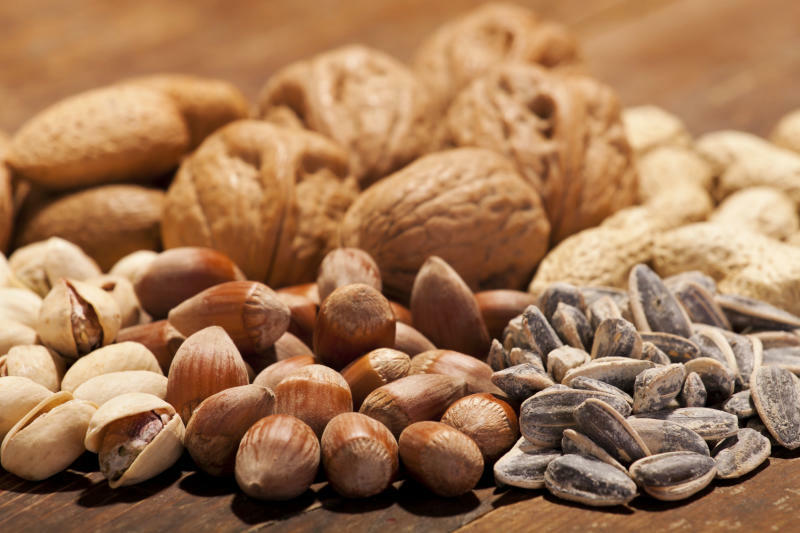 Participants who increased their nut intake after being diagnosed with diabetes had an 11 percent lower risk of cardiovascular disease, a 15 percent lower risk of coronary heart disease, a 25 percent lower risk of cardiovascular disease death, and a 27 percent lower risk of all-cause premature death when compared with those who did not change their nut-eating habits after their diagnosis. Moreover, each additional serving per week of total nuts was associated with a 3 percent lower risk of cardiovascular disease and 6 percent lower risk of cardiovascular disease death. The findings also held true even after the researchers had taken into account gender, smoking habits and body weight. With type 2 diabetes associated with an increased risk for high cholesterol, heart disease, and stroke, the new study suggests that eating nuts could be a simple way to help lower the risk of cardiovascular disease in this population. Although it is still unclear why nuts are beneficial for the heart, they are known to contain high amounts of unsaturated fatty acids, phytochemicals, fiber, vitamins such as vitamin E and folate, and minerals including calcium, potassium and magnesium, with the researchers adding that nuts appear to improve blood sugar control, blood pressure, metabolism of fats, inflammation and blood vessel wall function. Tree nuts may offer even more benefits because of they contain even higher levels of these nutrients than peanuts.